The Department of Landscape Architecture at the SUNY College of Environmental Science and Forestry (ESF) is included among the nation's top programs in the 2015 edition of America's Best Architecture and Design Schools. 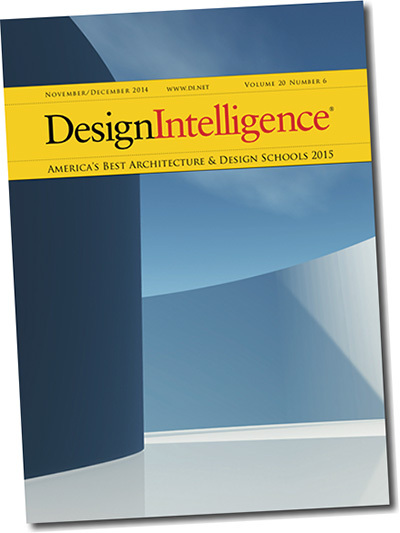 The publication ranks the nation's leading university programs in landscape architecture based on an annual survey of design professionals, college deans, and landscape architecture students recently conducted by DesignIntelligence and the Design Futures Council. The undergraduate landscape architecture program at ESF was ranked 15th in the United States, and ranked the third best program in the East, along with Penn State and Cornell University. ESF also ranked fifth in the nation in a survey question asking landscape architecture deans and department chairs to identify the program they admired most. "We are pleased that so many practicing landscape architects and university deans have again recognized the quality of our Landscape Architecture program and the outstanding students who graduate from ESF," said Douglas M. Johnston, chair of the department of Landscape Architecture. "Our students and faculty are committed to transforming America's cities, towns and natural settings into more welcoming, productive and healthy environments through better design, and ensuring that our design ideas are informed by both natural and social science. ESF students engage in community-based interactions with real clients that help them test design hypotheses, balance conflicting views and objectives, and meet the challenges they encounter in complex urban planning and landscape design projects worldwide," Johnston said. ESF's graduate degree program in landscape architecture was also recognized with a 13th best national ranking in last year's 2014 DesignIntelligence survey.